Part of learning any tool is to just try it out, sometimes we fail, sometimes we succeed, but if we learn from our failures then its never worthless. And if you figure out a few rules on the Silhouette Portrait (or cameo), you will find mostly successes. I'm going to cover one or two concepts per page. I'm going to assume you have a cutter, or are planning on getting one they are nicely built, and don't take up too much space, but the supplies do start to take up space, mats vinyl, paper, velum, stickers, foils, markers, blades,adapters....... expect this to take over a bit of space. Step 1: Handy Cheap Tools. They sell special scrapers, and weeding tools, and special transfer tape, but you can make do with alot of dollar store things, all of the above i have found at local dollar stores. The cutter is designed for things 9" and less wide (this can be a pain as a lot of vinyl and other stuff come in 12-14" wide) if wherever you are cutting is less than 9" wide you pretty much need a mat or to tape it to something wider. Expect that you will loose your blade setter cap quickly, this is ok because there is one built into the lefthand side of your cutters cutting bed. Most people at our place didn't know when they started on ours, that you have to manually set blade depth. its important to set it right, cut too deep and you scar up your mat or cut through the backing, cut to shallow and it won't be cut out. Step 3: It Does More Than Cut. I didn't take any photos of this project, but i also played with making cloud stickers, using a silver sharpie (barely fits in the holder) and then enlarging my pattern and cutting them out, to give people silver lined clouds to brighten their day. To use the above photoed pen holder, find the correct sized collet for your pen, you want your marker to fit in it snugly, but not suepr tight, , and slide it down the pen, then screw it into the base, this will make it grip into the pen with the point touching the cap, tighten the crown and the holder, then remove the cap and put it in your Cutter just like you would with a blade. standard sharpies will fit in the large sized collet but just barely. takes a little pushing and adjusting. If working with markers, you may want to put the cap back on if you are spending much time adjusting settings or drawings. In things with markings and cuttings, its usually best to mark first, but if its a very slow drying ink, you may choose to cut first, both work. If you are using 9" wide vinyl you can just put it in between the rollers, and just start cutting. you want to be sure to set your material type to vinyl, and be sure your cutter blade is dialed down to what it suggests, 1 or 2 as i recall. you want it to cut through the vinyl but leave the waxpaper backing intact. Once you are done cutting trim your artwork from the roll. (or cut more on any blank unused space), then you need to start with the "weeding" pulling out all the parts you don't want, (in the above key, you can see i accidentally left a big section of blue around the key when i applied it to the transfer paper and eventually to a car. A sharp dental pick is handy for weeding. the butterfly above, you can see the gears have lots of holes, too small for a fingernail, but i was able to scrape it with a hook and pull out the extra, all the white on the butterfly is where i removed/weeded the extra. Once its weeded, if its one piece you can just apply it to something, (a small spraybottle with a little soap and water can be handy for placing, because the vinyl's sticky side wont work much on wet surfaces, allowing you to slide and adjust. If the vinyl has un-attached parts, its handy to use something stuck to the top to let you peel off the wax paper and apply your vinyl, before removing the transfer "tape" i used cheap clear shelving paper, it didnt hold very well, but good enough. you can see it in the image above. because i used the water float option , i had to leave the transfer tape on until it all dried off. and the vinyl was stuck. I then pulled the transfer shelf paper and the extra vinyl i forgot to weed. We tried cutting duct-tape squares, but I think you would need a fabric blade. its cutter really would not cut the weave it it. Also tried Velum, butcher paper, freezer paper, construction paper, cardstock, and sticker paper all cut very nicely. Typing paper was a little thin, and we had some spots get snagged and dragged. and transparency film will score but the blade really cant cut through it. They sell fabric blades, so i hope to try those out sometime soon. I saw a video where someone put a carbide scribe in the pen holder, and etched into anodised aluminum dogtags. I also picked up some automatic mechanical pencils. im curious to see if we can make conductive drawings for playing with the USB Makey Makey computer input. There is a lot of room to try more things, these are very versatile and capable machines! 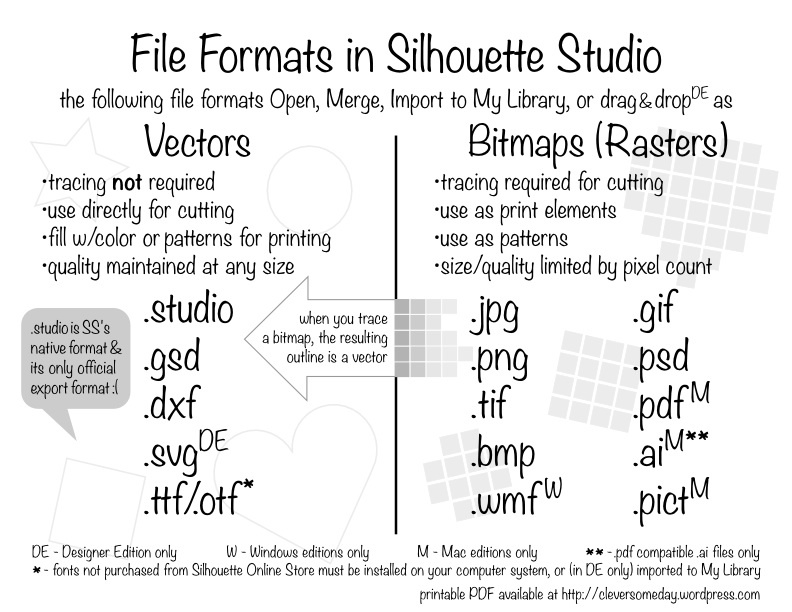 infact, http://www.silhouetteschoolblog.com/ is a great resource on its own! Silhouette is the brand, their Cameo is the big model, the one i was using is their small one, the Portrait model. sold at alot of craft stores, or online.